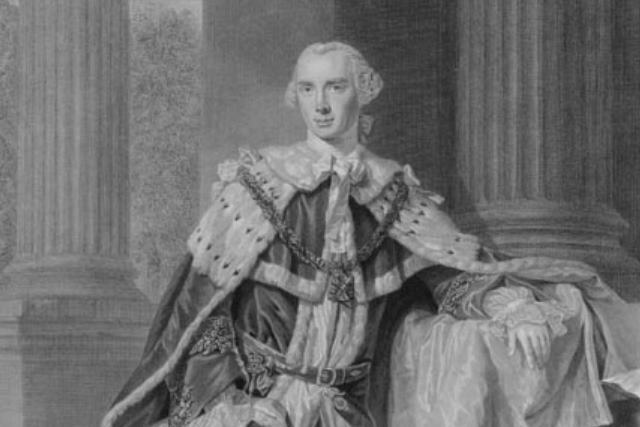 John Stuart, third Earl of Bute, was a Scottish aristocrat who rose, through his royal connections to a position of political pre-eminence. Bute was born in Edinburgh on 25 May 1713. Bute’s grandfather had been an MP for Buteshire in the Scottish parliament and was created Earl of Bute in April 1703. Bute’s father died in 1723 and the family estates were placed under the guardianship of Bute’s uncles, the Duke of Argyll and the Earl of Ilay, the major political power brokers of early Hanoverian Scotland. Bute was educated at Eton College and studied Civil Law in Leiden, graduating in 1732. In August 1736 Bute married Mary Wortley Montagu, only daughter and heiress of Edward and Lady Mary Wortley Montagu. The match brought Bute eleven children and, eventually, a sizeable inheritance from his wife’s family. His first real political experience came with election as one of the sixteen Scottish representative peers in the House of Lords in 1737. Bute was only an occasional attendee, however, and failed to secure re-election in 1741. Having spent time improving his Scottish estates, Bute moved to London after the outbreak of the 1745 pro-Stuart Jacobite rebellion. He came into the circle of Frederick, Prince of Wales, and quickly achieved his confidence. He retained the trust of Frederick’s wife, Augusta, after the prince’s death in 1751 and he became tutor to their eldest son, the future George III. Bute’s relationship with Prince George was a close one – he was a father-like figure for the young prince. Following George II’s death in October 1760, the new King promoted Bute quickly. He became a Privy Counsellor, Secretary of State for the Northern department and was created a British peer. Bute’s new colleagues, particularly William Pitt the Elder and the Duke of Newcastle, resented Bute’s rapid rise. With the country in the throes of the Seven Years War (1756-63), they feared that Bute would persuade the new King to bring the war to a swift close, despite Britain having achieved substantial victories across the globe, such as the conquest of Canada. Pitt eventually resigned in October 1761. Bute undoubtedly wanted to bring the war to a close. He was less attached to the Prussian alliance than either Pitt or Newcastle and his abandonment of Prussia caused Newcastle’s resignation in May 1762. This left the way clear for Bute to become First Lord of the Treasury. He pressed ahead with negotiations with France and he was able to steer a peace agreement through both Houses of Parliament. Pitt remained vehemently opposed to the terms of the peace and Bute was the subject of sustained personal attacks in the public sphere. His Scottishness and supposedly improper relations with George III’s mother, the Dowager Princess of Wales, were both satirised, including by the satirical journalist John Wilkes. His popularity was further damaged by the imposition of a new Cider Tax in 1763. The costs of the war meant that the government was keen both to cut expenditure and raise income but there were fears that the new tax would lead to an unacceptable degree of government intrusion into the lives of the population at large. Shortly after the bill passed in April 1763, Bute tendered his resignation. George III reluctantly accepted. The King continued to consult Bute on major issues, although his continued influence was probably not as great as many of Bute’s detractors claimed. For the politically discontented oppositional groups of this period, the notion of Bute’s power via ‘secret influence’ became a catch-all explanation for the failure of their ministries and inability to maintain the King’s favour. Constitutional questions about the relative powers of the monarch and his ministers were hotly debated during George III’s reign. Bute’s relationship with George III cooled after Pitt returned to office in 1766. In his political retirement he devoted himself to scholarship and using his considerable wealth as a patron of literary and scientific endeavour. He died in London in March 1792 and was buried on his familial estates at Rothesay.